Sarah E. Goode STEM Academy in Chicago was designed to embrace positive social change in facilities where residents share the common values that can build communities. 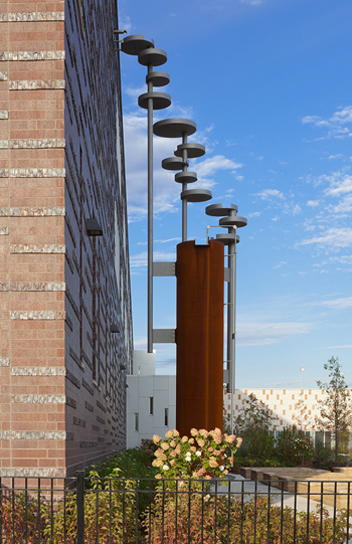 Exterior athletic facilities, accessible sidewalks and plazas, multi-functional spaces, and native landscaping connect the school’s site elements in sustainable ways to the neighborhood at large. In a long-standing association with the Chicago Public Schools, the Public Building Commission of Chicago manages millions of dollars of work for the CPS and has been instrumental in the "Modern Schools Across Chicago" initiative, a $1 billion dollar plan to bring brand new schools to Chicago's communities. Under "Modern Schools Across Chicago," the PBC and CPS have planned new high schools using a prototype design in which the schools have a gymnasium and indoor pool, available to the public during non-school hours. Each project embraces the type of positive social change and facilities where residents can gather to share the common values that truly build communities. Sarah E. Goode STEM Academy, located in the Ashburn neighborhood of Chicago’s 18th Ward, does exactly this serving 1,200 high school students and the community. The design incorporates features into the building to make it safer, stronger, more technologically adaptable and more environmentally friendly. Such features include sturdy block walls, green roofs, programmable HVAC systems, low emission building materials, and solar panels. 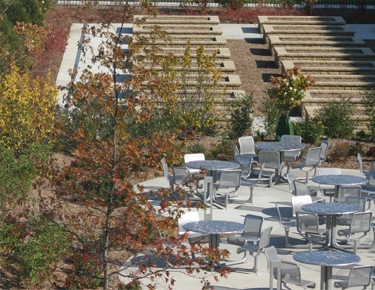 The 17.3 acre site provides athletic facilities, points of interest and education, and outdoor seating opportunities. 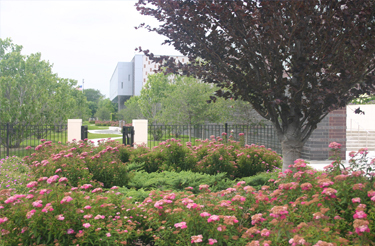 New site landscaping was designed to complement the modern architecture and enhance a campus-like, pedestrian oriented environment. 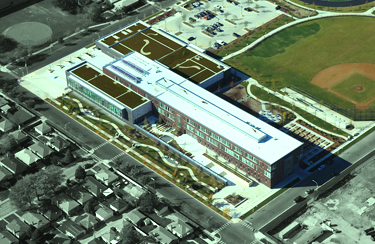 It connects the site elements to the school and the neighborhood at large. The exterior sport facilities include a baseball field, softball field, running track, tennis courts, and combination soccer and football field. 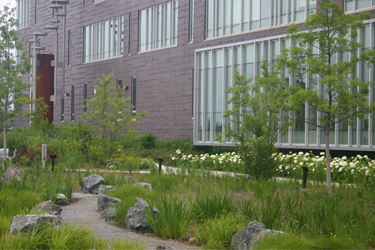 The site features accessible, multi-functional space including a biology garden, diverse native plantings, community gardens, outdoor classroom/picnic area, built bleachers and custom concrete sport seating, council ring, rain gardens, a cistern, geothermal field, and native plant education signs. The north side of the school contains 40 above ground community garden plots, a sculptural metal cistern, and a multi-functional outdoor classroom/picnic plaza. The community garden plots are 8’x5’ in size and 10 of them are handicapped accessible. The 4,000 plus gallon cistern collects rainwater from the school’s roof. A water gauge is mounted on the outside of the cistern showing how many feet of water have been collected. Gardeners can use 3 hose spigots at the base of the cistern providing harvested water to water the community garden plots, while overflow is released into the biology garden. The classroom/picnic plaza has cluster seating for 74 people with 4 handicapped accessible seats. Site paving and sidewalks connect key nodes and provide safe and accessible routes from the permeable paver parking lot, around the building exterior, in the main entry plaza, and walks connecting the various site features, providing an ease of maintenance and easy accessibility around the school. A bike lane dissects the site connecting the east side of the site to the parking lot where bicycle racks occupy the west end of the site. Protected existing trees along the 77th Street parkway and newly planted trees throughout the site help to define space, provide shade, sequester carbon, filter air and improve the quality of life for site users. A specimen beech tree, affectionately called the “Knowledge Tree”, is a prominent feature in the secondary entrance plaza. The “Knowledge Tree” compliments the purple brick color of the architecture as do other herbaceous and deciduous plants used in a variety of locations around the building. Plants used around the site are thornless, non-poisonous, and produce little fruit if near paved or other developed areas. Shrub species are predominantly dwarf in character for security clearances. 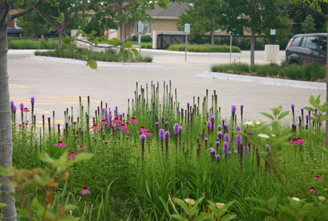 The highly diverse native plant palette makes the site function as an urban botanic garden for the STEM Academy’s biology students. The use of potable water was minimized. No permanent irrigation system was installed. 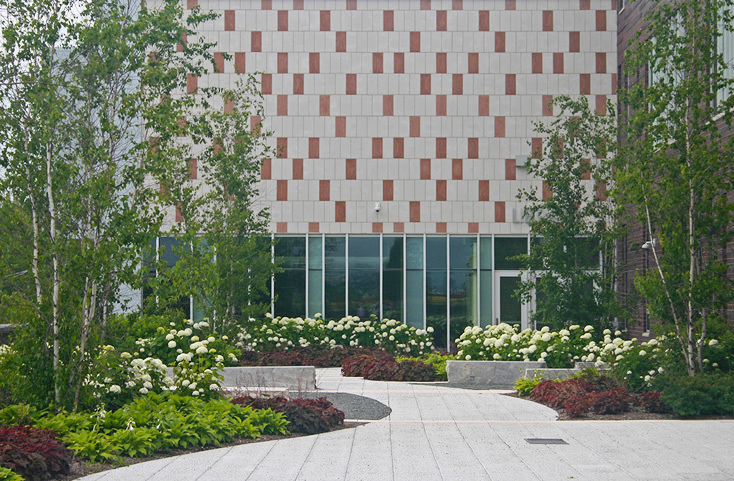 The extensive vegetated green roofs are a system of monolithic continuous media layers using sedum tiles. On the larger green roof area, expanded polystyrene foam shapes a berm to conceal an expansion joint and create visual interest from inside the school. Gravel nesting areas for killdeer birds, several bird houses for different bird species, and fallen trees for perches create an alternative bird habitat area above the biology garden. 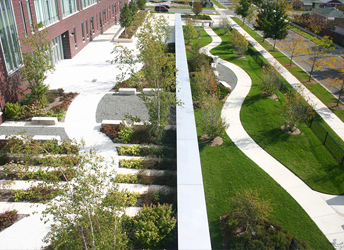 Stormwater is stored, cleaned and managed on the green roof, in the cistern and throughout the landscape by key design, including the planting of native vegetation, rain gardens, and in aggregate under the playing fields and permeable paver parking area. These site features increase its overall perviousness from an initial 85% impervious condition, to a runoff reduction of 42.6%. Light color hardscape materials lessen urban heat island effect along with 50% vegetated green roof and 265 new shade, ornamental, and evergreen trees. A special planning strategy minimized haul-off costs by utilizing the tons of gravel fill which would otherwise need to be removed from the site during site prep – thus transferring savings into landscape elements. Strategic elements of the plan that helped to achieve this savings include raising the north end of the site, and built up raised areas for viewing sports creating custom seating berms in lieu of aluminum stadium seating for each sporting program on the site. With a budget of 65 million, the overall project cost was under budget at 62.4 million, with landscape site elements being over 2 million of the cost. 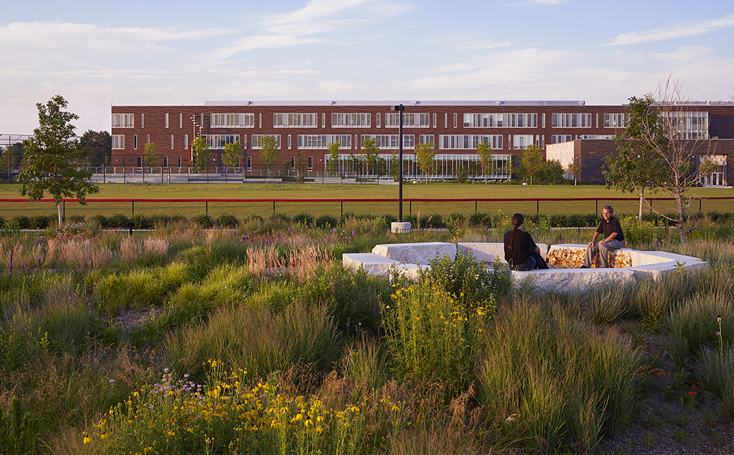 The building and site development strategies, green initiatives, and integrative team collaboration contributed to the first Chicago Public School to achieve a LEED Platinum rating. 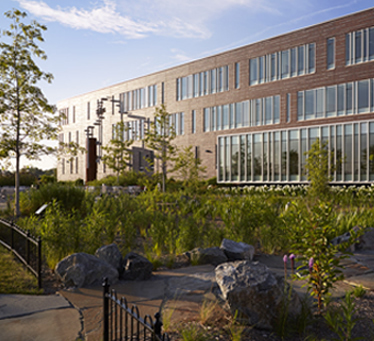 The project also achieved the 2014 Illinois Chapter ASLA President’s Award. Additionally, the project has been accepted into the Landscape Architecture Foundation’s 2014 Landscape Performance Series.